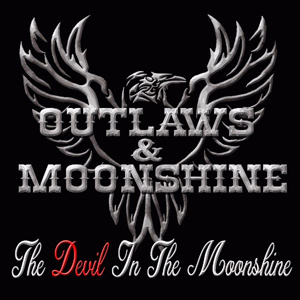 Indianapolis southern rockers OUTLAWS & MOONSHINE have released the lead single from their upcoming album, Devil In The Moonshine today through Nemesis/Vanity Music Group. The title track from the album (which releases on 24 November) is the party anthem to top all party anthems. As frontman Beau Van puts it, "Well, the inspiration for the song is ... remember when you were a kid and you put toothpicks in cinnamon and sucked on them? Well, now I mix 1/4 pure moonshine - not the store bought crap - with 3/4 Fireball and that's my Devil. Haha. As for the song, there's no big mystery there, it's just a damn good drinking song." The single also marks the debut of newest band member, steel guitarist, Travis, whom lead guitarist Mike back refers to as "an accomplished slide player with a great ear who teaches guitar on the side. He tends to be the quiet one of the band, but, his slick slide guitar give our music more of that southern sound." "Devil In The Moonshine" can be purchased on iTunes and streamed on Spotify.